You know when you watch movies at Cineplex and they have those ads pointing out rude people like Harvey Hogger, Tommy Texter or Suzy Seat Kicker? Well, I'd like to add a Tammy Table Troll (sorry if I insulted all the Tammys out there). 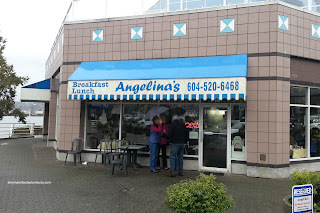 You see, we were waiting for a table at Angelina's and witnessed 2 ladies occupy a table for 4 prior to us arriving and after us leaving (that would put it at 3 hours, more on that later...). Anyways, we did end up getting a table and set off to use another one of my many Groupons. 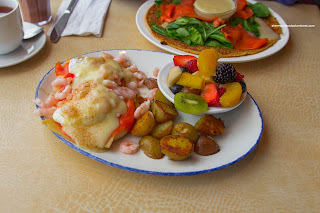 For myself, I decided to try their Seafood Benny featuring smoked salmon and baby shrimp. Smothered in a enough Hollandaise that hid almost everything underneath, the sauce actually ate rather light with a mild flavour and lack of acidity. The poached eggs were perfectly runny while the smoked salmon was generous in portion. That included the good amount of buttery baby shrimp, which were a bit salty. We weren't fans of the potatoes though as some were undercooked. The fruit was attractive and fresh though. Viv continued the fruit theme with her Berry Pannekoeken topped with strawberries, blackberries and blueberries. 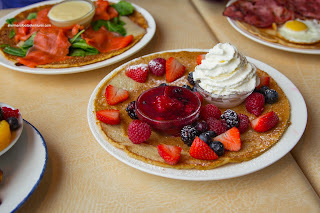 This was also served with fresh whipped cream and a berry compote. Thin and fairly light, the pannekoeken was nicely textured and mildly flavoured. 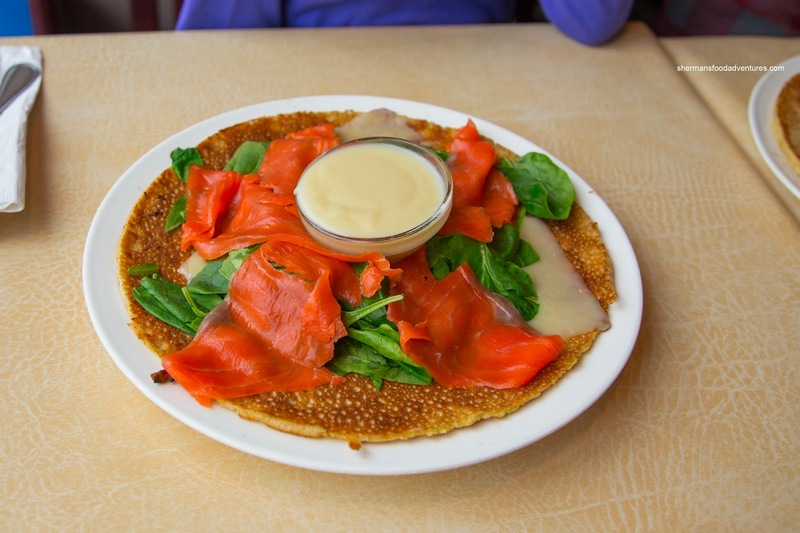 My daughter decided on the Smoked Salmon and Spinach Pannekoeken with Edam cheese. This was fairly straightforward with the same light and thin pannekoeken topped with melted cheese, fresh spinach leaves and smoked salmon with a side of Hollandaise. This was pleasant enough with little fanfare. 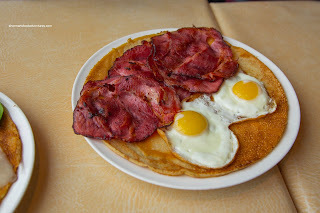 Going more heavy duty, my son had the Bacon and Eggs Pannekoeken. This was a pretty savoury with salty bacon which went well with the syrup and pannekoeken. Of note, the prices of these items were about $3-$5 less than De Dutch. However, the one thing that annoyed us was the time it took for our order (over 45 minutes!). That was the same for others too as we observed, which would mean that the ladies hogging the table were definitely there for over 3 hours. I digress. 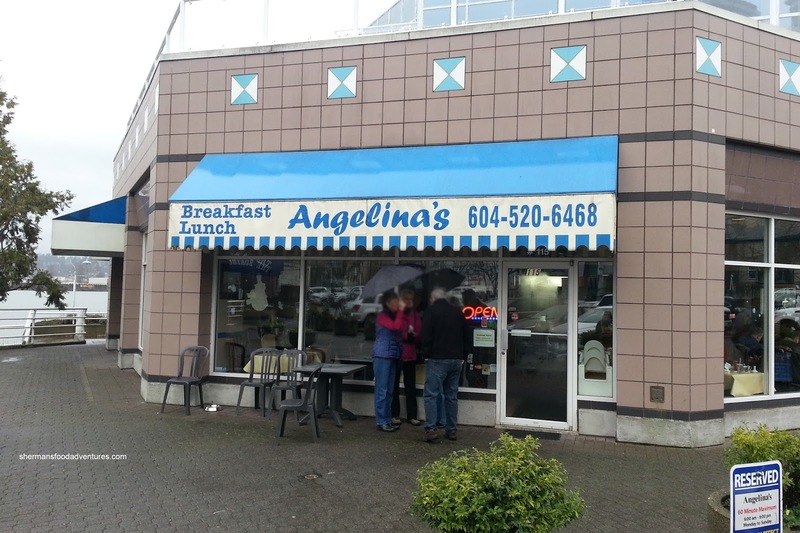 Overall, we liked the food at Angelina's, just be prepared to wait.